Your understanding of light will have a profound effect on the quality of your images. Before you can use any lighting techniques, you must become confident in your abilities to help your camera see. This book primarily focuses on the aperture and shutter speed. Other camera features which will modify your camera’s natural ability to see light are ISO, focal length, flashes and of course the environment you are shooting in. These factors all come at a cost to the condition of your images, thus it will be easier to you learn them after you have mastered your ability to work with the shutter speed and aperture. Your focal length will be fixed at 50mm, and your ISO will remain below 800 to avoid any major distortions to your work. If you are not yet acquainted with your camera’s light meter, then let’s just say this guy is about to become your boon companion, and he will demand a lot of your attention. Not paying attention to him will deliver images with blown highlights and underexposure issues. This is how your camera communicates with you about light. The light meter is controlled by ISO, shutter speed, focal length and aperture primarily. For now, you should only be focusing on shutter speed and aperture, because they are the most versatile than other settings and have less effect on the overall quality of your images (when used correctly.) Avoid altering the ISO as much as possible. 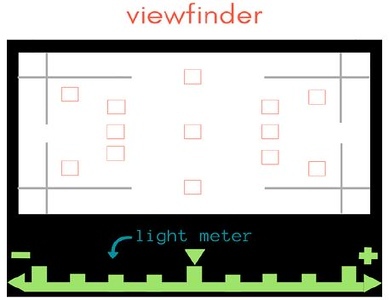 The viewfinder for each camera is is what makes it possible to correct exposure issues. The indicator for the light meter will bounce around depending on how far to the right and left you move the main dial on your camera for both shutter speed and aperture. The indicator should be as near to the center of the meter as possible. The way a camera perceives light is far different than the human eye. For example, in a pitch dark room where you are blinded by darkness, your camera may still find it easy to pick up on the details of the room. Or on the other hand, you may be able to see with perfect clarity in some midday sunlight while your camera can't see a thing. Knowing what your camera is seeing is done by paying attention to the light meter. The goal is to get the indicator for the light meter as close as possible to the center of the meter. When an image is underexposed it will turn out dark, and the indicator will be far to the left on the meter. Too much light and it will be extremely far to the right. Using the main dial on your camera and getting the indictor to the middle will fix both over and under exposure issues.